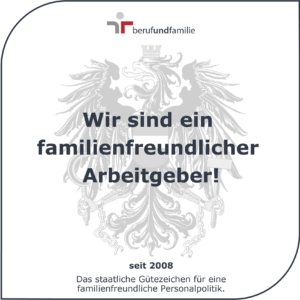 The Verkehrsbüro Group is proud of its state certification for family-friendliness: the Federal Ministry for Health, Family and Youth has scrutinised us carefully. As part of a multi-level annual audit, our company culture is examined annually with regard to family-friendly and commercially viable solutions. 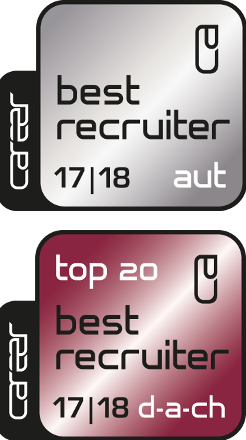 In particular we have scored points as we offer employees on maternity leave the possibility to take part in all training and further education events offered by the company – this makes the return after parental leave much easier. 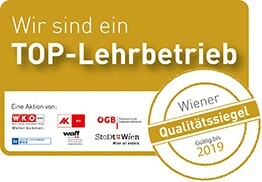 Together with the City of Vienna, the „TOP-Lehrbetrieb“ Quality Seal is awarded by the Chamber of Commerce, the Chamber of Labour, the Austrian Trade Union Federation and the Federation of Austrian Industry to companies in Vienna who offer outstanding training schemes for apprentices. For the award, which is valid for four years, companies must meet very stringent evaluation criteria. The Verkehrsbüro Group trains numerous apprentices every year; in doing so they not only help meet the steadily increasing demand for qualified skilled workers, but at the same time also offer young people a very practice-oriented education with a variety of opportunities. Above all we are delighted that our Café Central was nominated the top “Apprentice Training Company 2017”. Austropa Interconvention is the first Austrian congress organiser to be awarded the eco-label Green Meetings and Green Events from the Federal Ministry of Agriculture, Forestry, Environment and Water Management. This label is recognition of our pioneering role in environmental protection and sustainability in the congress and event branch. We are leaders in the environmental-friendly planning, organisation and operation of events. Austria Trend Hotels have been honoured with the “Viktualia Award”. The award for the best projects and ideas for the reduction of food waste is bestowed by the Federal Ministry of Agriculture, Forestry, Environment and Water Management. Projects and ideas are awarded in five categories. The Austria Trend Hotels received the “Golden Apple” award in the “Gastronomy and Catering” sector – for their particularly careful use of natural resources and the reduction of food waste.